Tim, first of all: Thanks for this wonderful program. 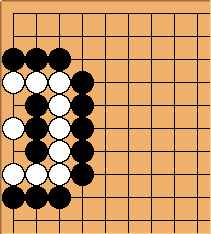 It is the best program for studying tsumego. Do you have any plans to release a Pocket PC version of it? TimK: I don't have plans to currently, but I would be willing to help anyone who wanted to work on that. I don't have any experience with Java on PocketPC. TimK: The way I usually handle this is to create two problems - one with Black to play, one with White. If I want to include a pass/tenuki as a possible choice, I mark a point A, and in the description of the problem put something like "A=tenuki". Tim, How about a Java version for the cell phone? :) Then I could use GoGrinder anywhere!